Then the dancers entered, intoned a few chordal notes themselves, and integrated into a loose configuration with the Adlers. They all continued to dance together. YES, here the singers danced, and the dancers sang. It crossed my mind that this approach must have required a major rehearsal commitment from all involved! And, although the recent Merola announcement that only one opera would be produced in the coming season, perhaps that will leave room for something more experimental like this. If so…a smart move, me thinks! The Adler quartet accompanied the full dance company in the polyphonic choral piece “In Manus Tuas,” by John Sheppard (English, c.1515–1558). How exciting to hear such ripe voices in this repertoire, usually sung by a choir of 12+ (ie: Tallis Scholars, Chanticleer, etc.). It was immediately clear that the singers were mic’d. Fortunately it was not intrusive, although I didn’t feel it was necessary with these full-voiced legit opera singers. With the mix of dance and singing, perhaps it was only fair for give them to have this advantage. Although, Robert Wilson’s operatic productions involve similarly demanding stylized movement, and over a much longer haul…and those singers aren’t mic’d. Next up, Belongie’s “Frühlingsglaube,” by Schubert, danced by Meredith Webster, Paolo Arrais and Ricardo Zayas. King clearly encouraged the singers to continue moving freely, and in their own style as they sang. It prevented a stand-and-sing feel, and added an ethereal feel to the proceedings. In Belongie’s case, it was a bit too mannered and baroque for my taste, but as always he sang beautifully and uniquely. Also, the singers performed at a 3/4 angle, so they were facing the dancers and audience equally. At times this felt a bit withdrawn or uninvolving, but I understood the desire to keep them as connected to the dancers as the audience. Particularly in Belongie’s case, there were times when it felt as if he was performing for himself, eyes facing downward, contemplative in tone and carriage. He reminds me quite a lot of one of the great countertenor renegades of the 80’s, Drew Minter. Laurel Keen danced a solo to the quartet’s “Triad,” then to Lahyani’s “Dein Blaues Auge,” by Brahms. Her ample voice flooded out into the audience, and aurally melded with Keen’s movement. I hadn’t formerly been a fan of Kness’ more stolid approach, but he won me over here, with Schubert’s “Die Mainacht.” Caroline Rocher danced this with the company. I felt that this format served Kness the best of the quartet, as it softened him, encouraging him to integrate more vulnerability, and shed some of the alpha-male, bari-hunk opera stereotype that he sometimes tends towards. He offered some tones worthy of Fisher-Dieskau. This was the vocal highlight of the evening for me, gifting me goose bumps and tears. Lahani sat under a spotlight upstage as each dancer approached and movingly interacted with her (momentarily sat or set their head on her lap, or was held by her), as if being healed. This integration of song and dance worked particularly well. Gartland offered up “A Cloris,” by Reynaldo Hahn (1874 – 1947, Venezuelan, naturalised French). It was a lovely song, reminding me I need to familiarize myself more with this composer. This accompanied a duo by Webster and Keelan Whitmore. Then, to my great pleasure she sang Strauss’ “Allerseelen,” joined by the full dance company. 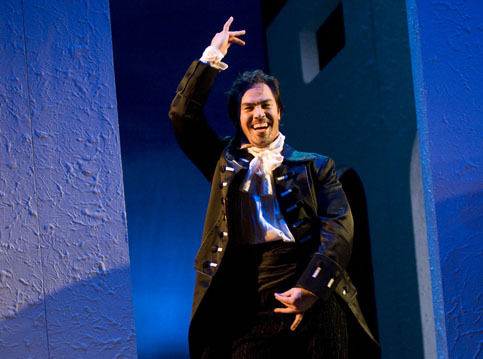 At the end of this piece, Gartland walked slowly towards the audience, and sang directly out into the house in the most “operatic” moment of the evening. It was very effective staging choice. My feelings about her singing still hold true from my Merola introduction to her. She too often pushes past her light lyric tonal capacity, attempting to be a juicy lyric, when I wish she would just revel in her vocal sweet spot. “Intonation” was offered by Lahyani and Kness, with Gartland and Whitmore dancing. Gartland (and Lahyani) provided the most convincing and natural dancing and movement of the quartet, not surprising since almost all women, especially performers have SOME dance training when they’re younger. Interestingly, unlike any other recital or vocal concert, the music, particularly its specific meaning or translation felt incidental. In other words, it seemed to serve as almost a soundtrack for the dancing. The text didn’t seem to be linked literally to any of the dance concepts, but rather a more generalized feel of the music seemed to inspire the movement. The same held true for the singers’ performance, which didn’t aim to have a textual specificity in their delivery or accompanying movement. I didn’t object to this, as it would likely be too much to take in, but it was an adjustment from the norm. Lahyani sang the soprano chestnut “Lascia Ch’io Pianga,” by Handel. She delivered dark, sensuous tones, as Arrais, Whitmore and Zayas danced with Ashley Jackson in some of the most effective choreo of this first half. The men repeatedly lifted and rotated her, in a ceremonial manner that felt empowering and adoring of her femininity and beauty. Kness sang an imposing and moving “Von Ewiger Liebe,” by Brahms, while all four men danced. Again, he surprised me with his dynamic and emotional range. In the final number, the quartet took turns singing overlapping portions of Faure’s lovely “Pie Jesu.” Keen and Conway danced an effecting duo. Keen’s duo with Conway was the dance highlight of the program. At one point she pulled him across the stage, his body so responsive in the moment it appeared like complete organic improvisation. I was impressed with how well Lahyani reigned in her voice for this typically lyric/boy soprano piece. At times the choreo seemed at odds with the music, a bit too animal-like for my taste (ie: rattlesnake-like wrists, feral twitches, feline slithering, etc. ), but I am more of a classicist, so perhaps I just need to loosen up. Even these choices were always interesting and/or whimsical, nonetheless. The male dancer’s costumes were tight charcoal or brown dance shorts. They were perfectly minimal, and allowed their natural sexuality and power to come through fully. However, I felt the women’s celadon green costumes and uniformly pulled-back hair styling made them feel too virginal, too restrained, and not expressive equals to the men. It also erased their physical differences, making them all feel a bit too much alike. This piece used very dynamic and diverse ethnic music by Zakir Hussain. It was at turns tribal, probing, celebratory, and eerie. In both this number, and the first half Conway, Zayas and Whitmore were the strongest dancers of the evening…the men overshadowing the women overall. A black drop-cloth moved horizontally to reveal different portions of a dramatically lit, ruffled, iridescent fabric behind it. It was very effective and simple. Sometimes it looked like the rough walls of a cave, other times like a rich, bejeweled gold garment. The audience was roused to a well deserved standing-O! I felt that overall “Rasa” delivered more memorable and distinct choreo from the AKLB dancers than the first half. « “The 40 Year-Old Homo” Blog Roast!